find more one of a kind vintage to mail to you. Crushi.com: Hi! We're so glad you're visiting. You have found a great resource for one of a kind and unique vintage. 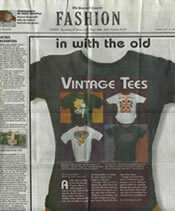 It's all real original vintage t-shirt iron-ons from a professional t-shirt shop (back in the 1970s and 80s). You'll find some really awesome items. These are not reproductions. We've got examples we've put on shirts, but you can do anything you want with them. They are extremely, extremely rare. I cannot stress that enough. So if you're into unique items check through out the site. Share with friends, join us on facebook, twitter, ebay or etsy and please let your friends know about us. We don't do any advertising and rely on word of mouth. Once an item is gone, it is gone forever. Since these are vintage there is no way to get more and believe me I've looked all across this great country of ours. All USA mailings come with tracking and delivery confirmation. Items are packaged on flat cardboard with do not bend stamps. We've run out of hundreds of designs and are constantly running out of prints. I'll post more if I can find more so please come back and visit often. I still have a few hundred designs I haven't been able to get photographed yet but will be updating the site as I go. We pool our talents and time to make it easy for you to order online and get in the mail within a few days. Unique Vintage you won't find anywhere else in the world! We consider all offers so please email us if there are some prints you are looking for but aren't on the website. We do have some stock that hasn't been put up yet, email a picture, or describe what it looks like, we may have one. Also, you're welcome to make offers for any items you see on the website, ebay or etsy. We do want to sell these... so please contact us if you're interested in a few but they're a little over your price range, we can take offers and send invoices via Paypal so your payment is safe. Check out our glowing feedback too! We're really dedicated and please remember this is a small, small, small specialty business, not a multi-billon dollar website business like Amazon. We do everything and ship everything out right away but also have jobs to support ourselfs. This is a very small side project and we take it seriously and hope to find an audience so we can offer more one of a kind products and pay for lunch for ourselves sometime. Claudia: Vintage Finds, Sales, Clothing Design, Fashion Consultant. 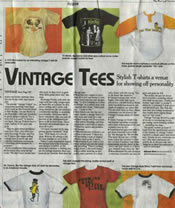 Crushi.com on the front page of the fashion section of a USA newspaper!